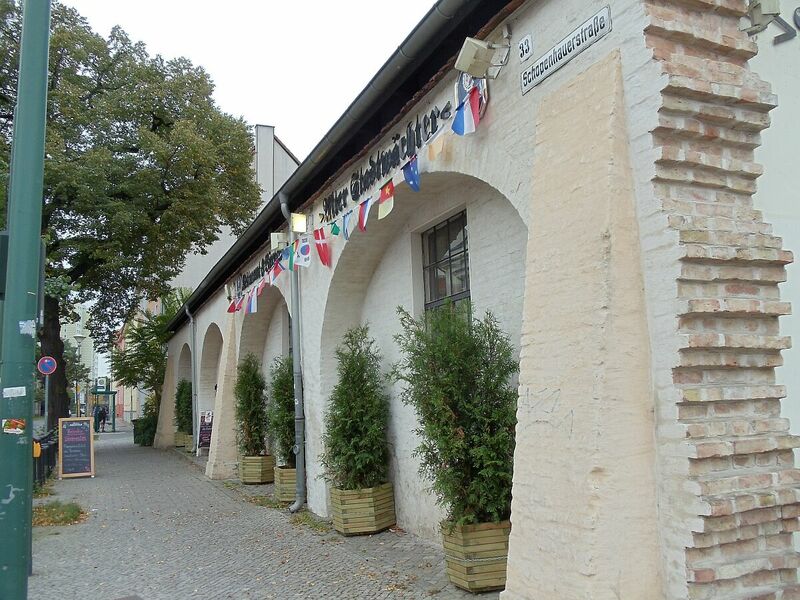 Like all old towns in Germany, Potsdam used to have a sturdy city wall. Location and size of the wall changed over time. 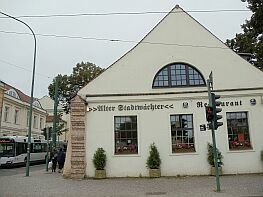 Usually, all walls were meant to protect the town from intruders. 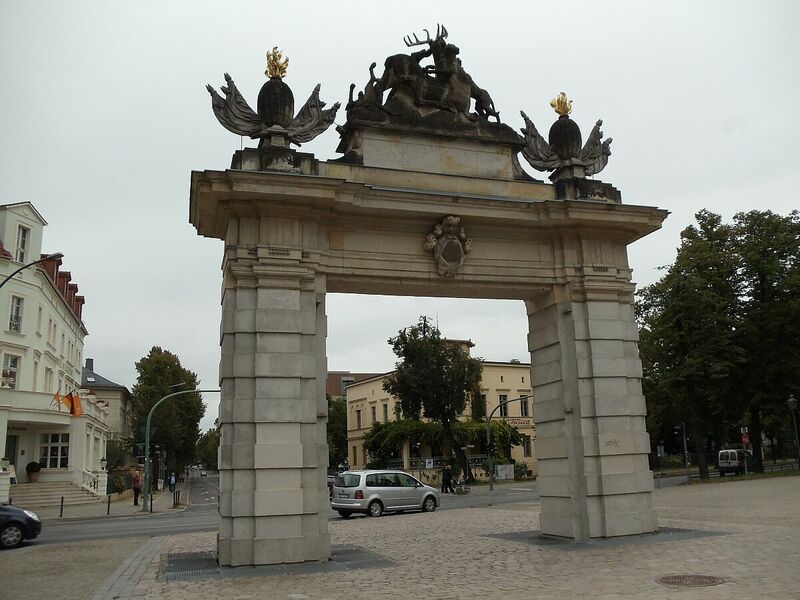 However, Potsdam's last city wall, built in 1718 by King Frederick William I, wasn't meant to keep people out, but to keep soldiers of the Potsdam garrison from deserting. 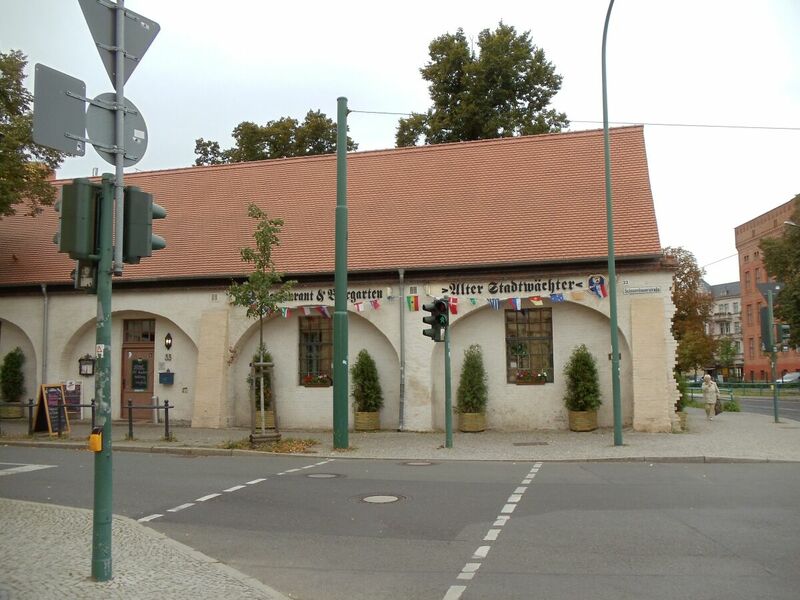 As that, the The Soldier King's "Access and Desertion Wall" was stunningly similar in purpose to another Wall, erected in Germany 143 years later. 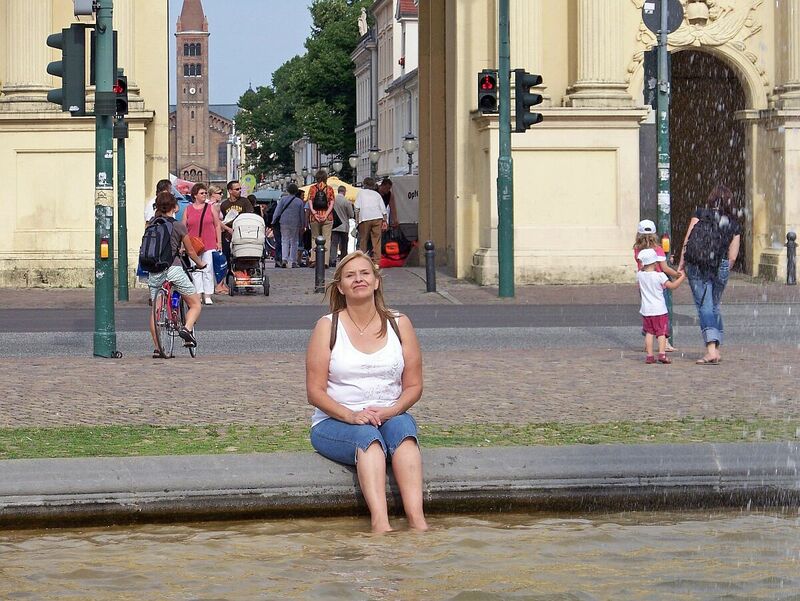 The picture to the right is borrowed from PotsdamWiki, the tree pictures below were taken at Louise Square during our 2010 visit. 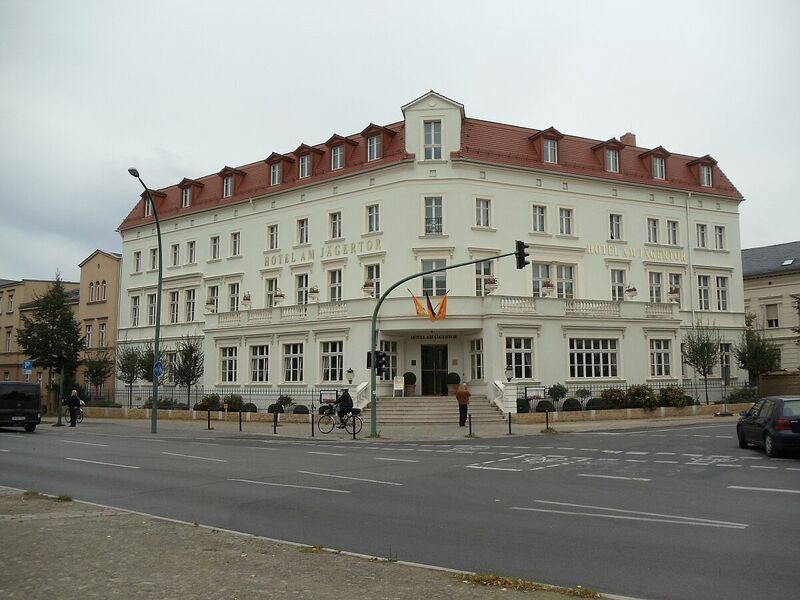 The building in the middle used to be the customs house (today it is a restaurant). 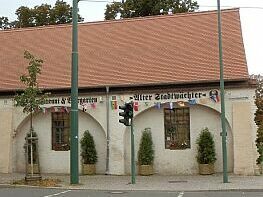 Parts of the original wall were preserved along the building. 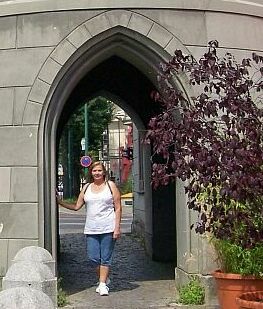 There were five gates in the wall, three of which are still standing today. 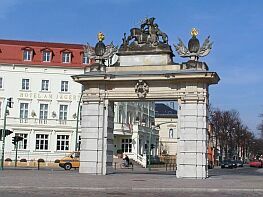 Not to be confused with the famous Brandenburg Gate in Berlin, this gate in what is now downtown Potsdam is 18 years older than its famous namesake. 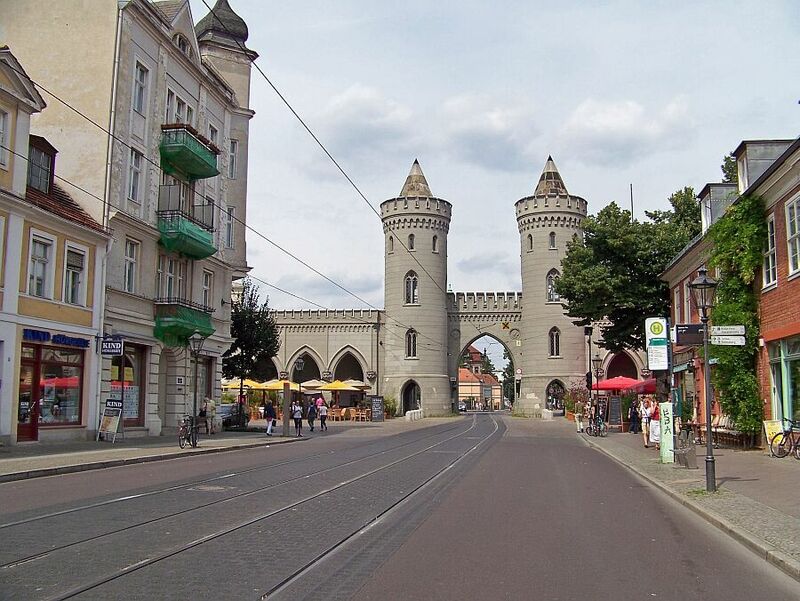 The reason for the name is the same in both cases: the roads starting at both Brandenburg gates used to lead to the town of Brandenburg. 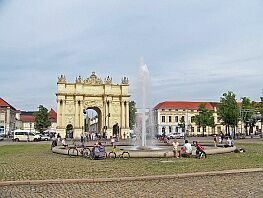 A first, wooden gate was erected here in 1733, but later, in 1770, King Frederick the Great had a new, more prestigious gate built. Just a couple of years earlier, Frederick the Great was one of the winners of the Seven Years War, establishing Prussia as a new European super power. 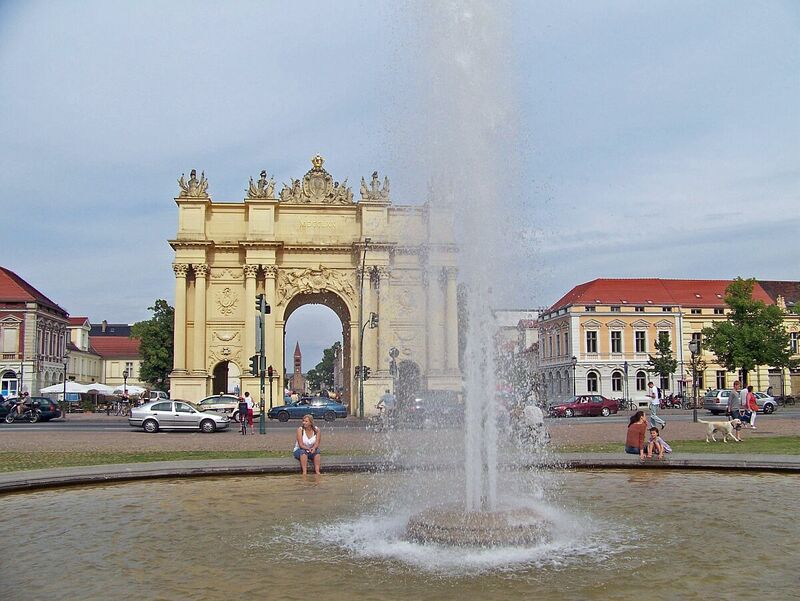 Now, the Brandenburg Gate was to become Frederick's Triumphal Arch. 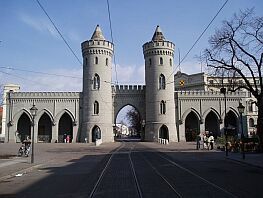 It was designed after the Arch of Constantine in Rome but it sure has its own characteristics, especially since it has been designed by not one but two architects: The side facing the town was designed by Carl von Gontard, while his scholar Georg Christian Unger designed the side facing the country. 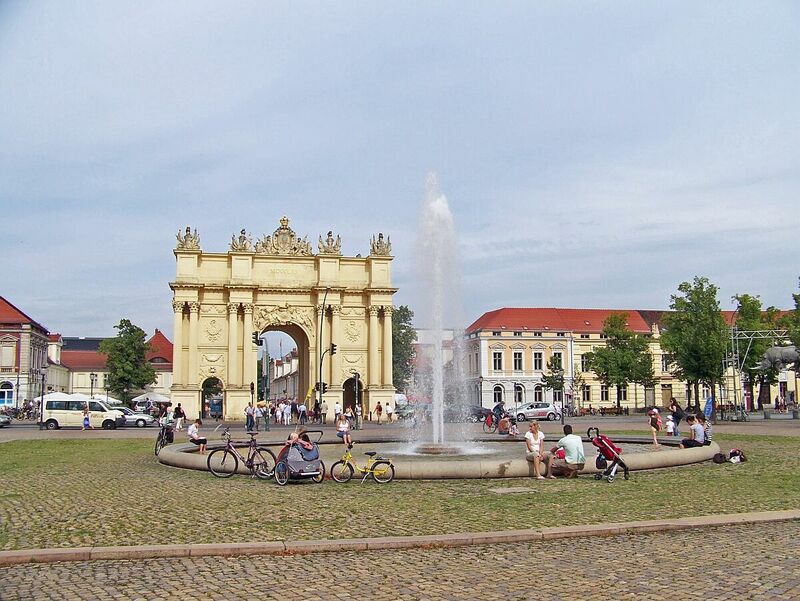 Today, the gate is part of Louise Square, named after Prussia's most famous Queen Louise of Mecklenburg-Strelitz, who arrived in Potsdam through this gate in 1793, to become the wife of King Fredrick William III. 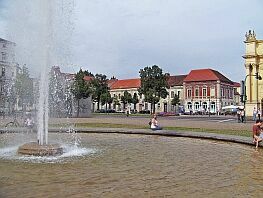 The fountain in the center was originally designed in 1854 by Joseph Lenne. 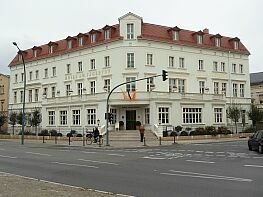 It was demolished in the early 1900s and rebuilt in 2001. 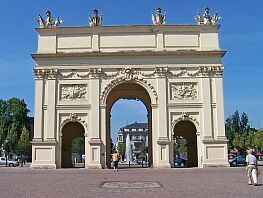 The Nauen Gate has been part of Potsdam's fortification since 1720. 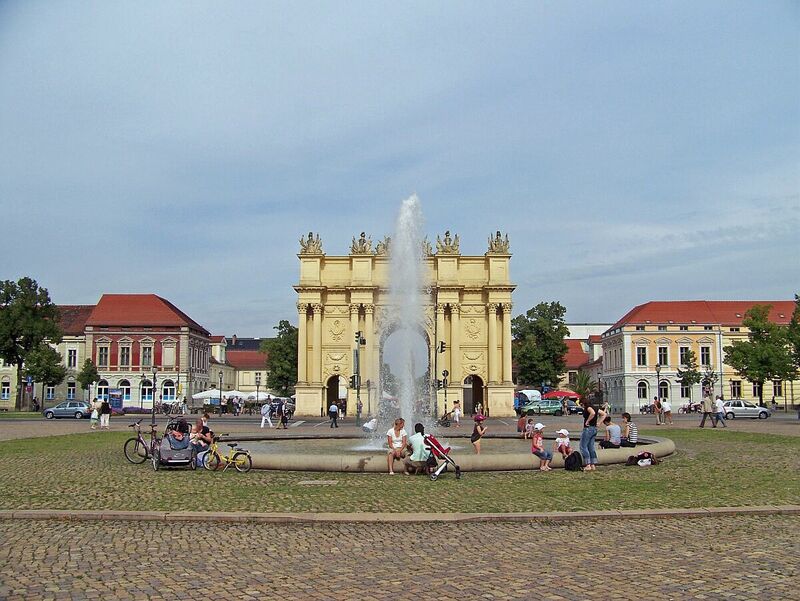 The current gate was designed by Johann Gottfried Büring, after an original sketch by King Frederick the Great. It was built in 1755 and is one of the first examples of English Gothic Revival architecture in Continental Europe. 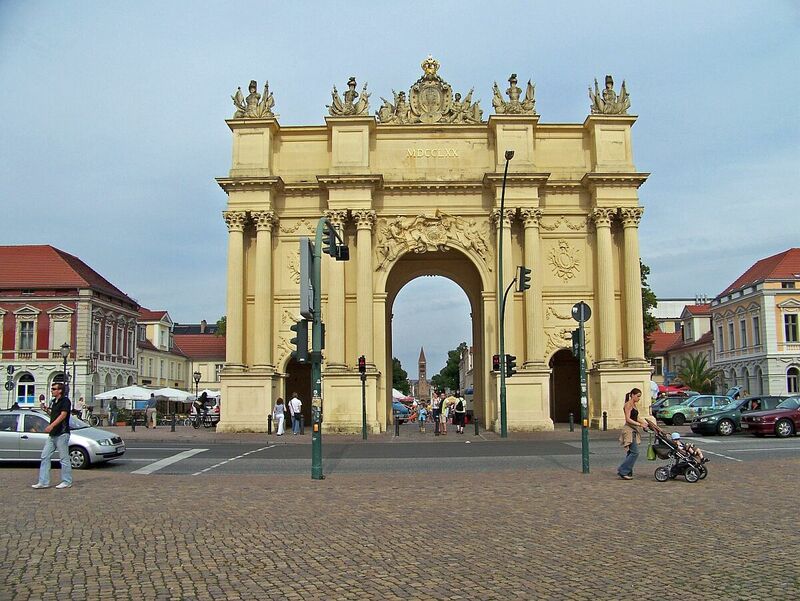 Built in 1733, the Hunter's Gate is the oldest of Potsdam's three preserved gates. It is named for the royal hunting grounds that used to be right beyond the gate. 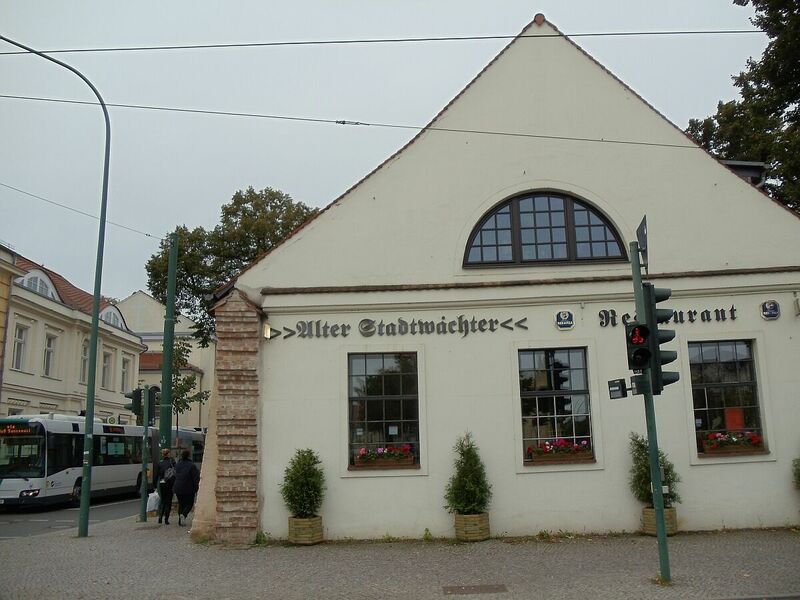 Apparently, the name of the architect has been lost in time. The picture to the left is borrowed from wikipedia. The three pictures below show the gate and the nearby Hunter's Gate Hotel. They were taken during our 2010 visit. Onle a few remains are left of the other two gates. 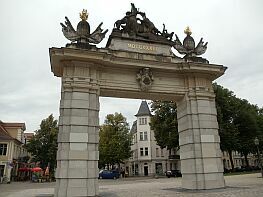 The original Neustadt Gate was built in 1753 under the supervision of Georg von Knobelsdorff. 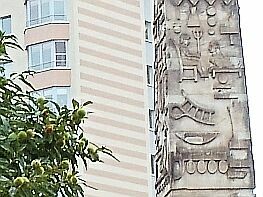 It consisted of two obelisks, adorned with Egyptian looking hiroglyphs. Since original hiroglyphs were not deciphered until the 1820s, the "writing" on the obelisks was pure fiction. The gate was severely damaged in World War II. Only one obelisk survived intact. 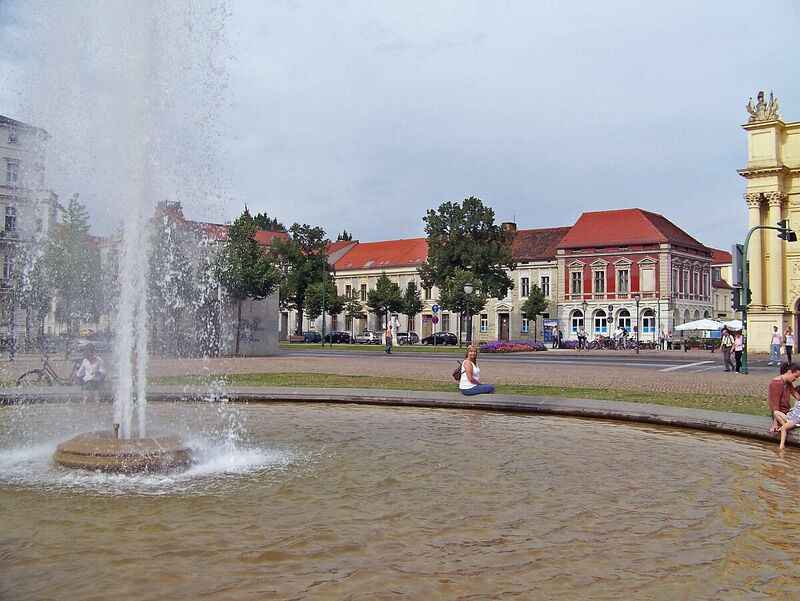 In 1969, when one of Potsdam's main streets was extended further west, the remains were completely demolished. 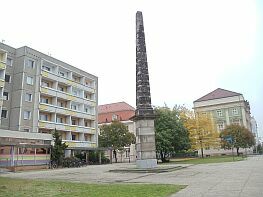 The one surviving obelisk, however, was restored in 1981 and was placed near the original location of the gate. 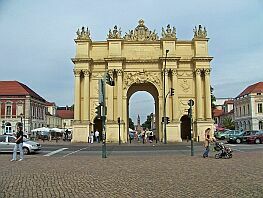 The original Berlin Gate, built in 1733, was a lot closer to the center of town. 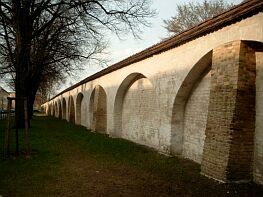 In 1745, after an expansion of the town, a new city wall was built and a new gate was needed. It was designed and built in 1753 by Johann Bouman, under direct supervision of King Frederick the Great. Originally, this gate in the east of town was a Triumphal Arch similar to that in the west, the Brandenburg Gate. 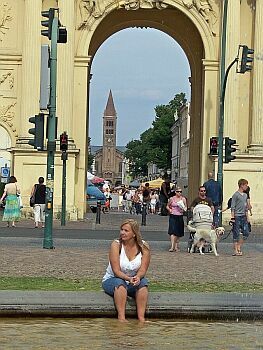 The Gate was damaged in World War II and almost completely demolished when the street that went through it was widened in 1952. 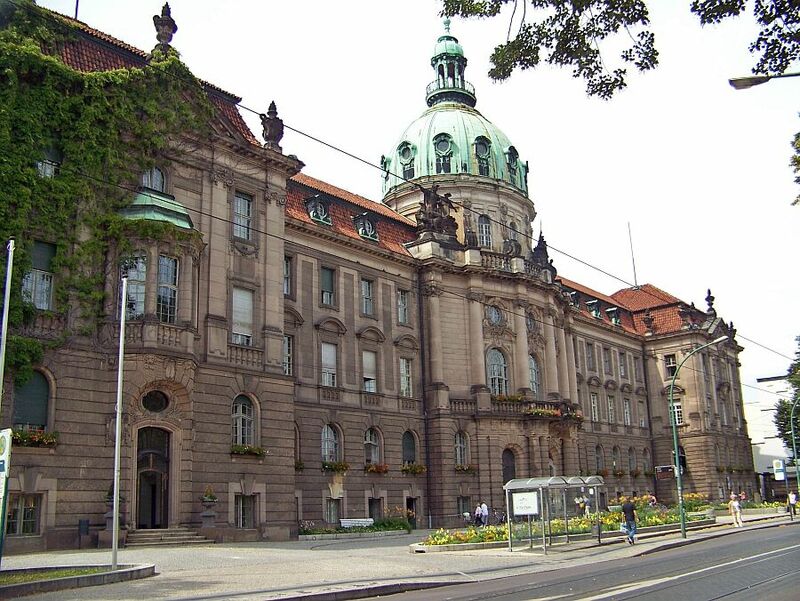 Since then, only a piece of the right wing (shown left in a picture borrowed from PotsdamWiki) remains. 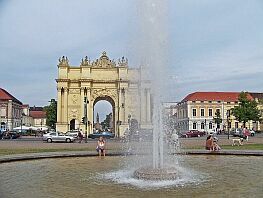 PotsdamWiki has good articles in German language about all Potsdam gates of past and present. 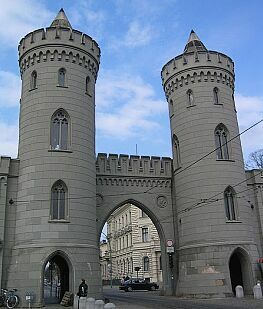 Each article is accompanied by at least one picture showing the gate in its original state. Click the pictures below to get to the articles and pictures. 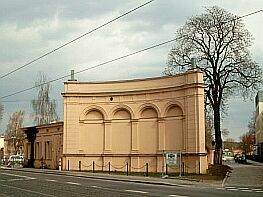 In addition to the five gates in the city wall, there was also the Teltow Tor, which actually was just two custom houses at Potsdam's "Long Bridge." 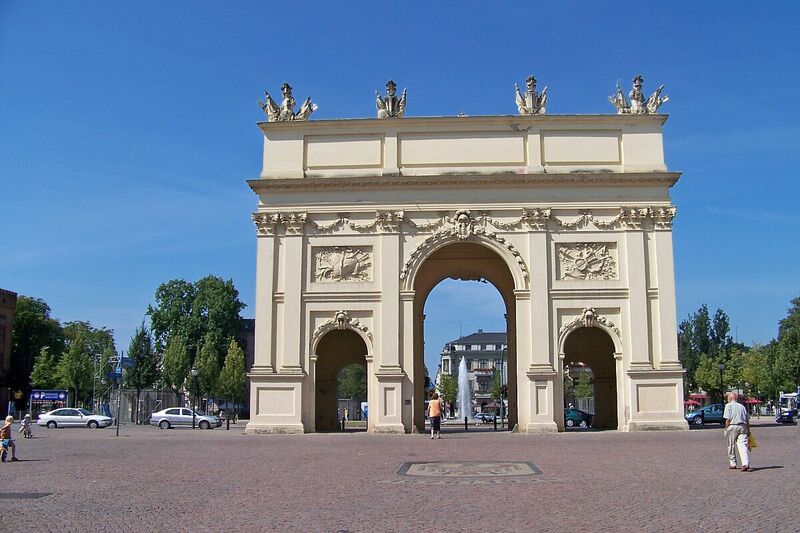 It was destroyed, when the German Army blew up the bridge at the end of World War II. 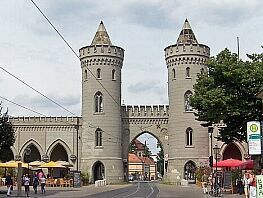 Teltow Gate, 1840 The city Canal too had to custom gates.